Our education team currently offers three teachers institutes each year. The Weinstein Properties Story of Virginia Teachers Institute is a week-long program that is offered twice each summer. The dates and subject of Primarily Virginia, the VHS online institute, varies from year to year. All institutes are open to private and public school teachers of any grade level. We also offer a teacher workshops using primary resources. In conjunction with Longwood University, the Virginia Museum of History & Culture announces its Weinstein Properties Story of Virginia Teachers Institutes for 2019. 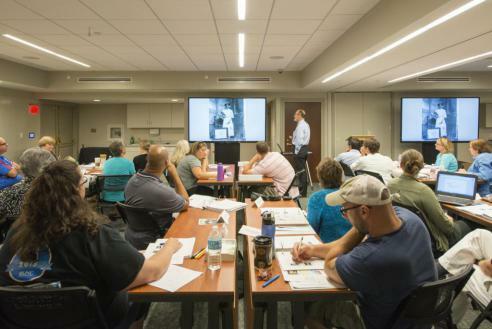 Earn re-certification points while exploring the history of Virginia, project-based learning, and teaching with primary sources! Choose between two sessions: July 15-19 or July 29-August 2. The institute will be held at the Virginia Museum of History & Culture with a day-long field trip to the Robert Russa Moton Museum in Farmville, Virginia. Throughout the week teachers will examine stories from Virginia's past through primary sources. Experts from the Virginia Museum of History & Culture and Longwood University will provide examples for project-based learning, performance-based assessments, and tips and techniques for engaging students in grades K-12. The cost is $50, which will be refunded upon completion of the class. In addition, we require a letter of recommendation from your supervisor. Lunches and materials are provided free of charge, and participating teachers will be eligible for CEUs and recertification points. Primarily Virginia is an online course designed for teachers to explore Virginia’s past by examining objects and primary sources. These pieces of the past will be used as a lens to examine different historical eras in Virginia history. All course work is to be completed through the course website, and there are no required in-person class meetings. This course is offered three times a year and is free of charge to Virginia teachers, thanks to the generous support of the WestRock Foundation. Registration for the Spring 2019 session of Primarily Virginia is now open! The course is limited to 30 participants and will launch on January 21, 2019. Please register by January 16, 2019. Use the link below to register online today.